Initial Jobless Claims - What Does It Mean? What are initial jobless claims? 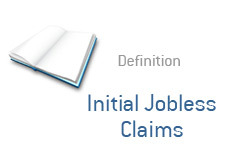 What is the definition of an "initial jobless claim". If you follow the monthly unemployment numbers that are released by the Labor Department, then you have undoubtedly heard the term "initial jobless claims" being used. "Initial jobless claims were up 17,000 to 551,000"
"Initial jobless claims were down 37,000 to 495,000"
An "initial jobless claim" is when somebody applies for unemployment benefits for the first time. States offer 26 weeks of benefits for the newly unemployed (who are trying to find work), with the average payment working out to about $300 per week. If initial jobless claims are rising, then this means that work is harder to find. If initial jobless claims are falling, then the economy is strengthening and there are more jobs to be had.